Let’s start the exploration of the use of intention by investigating how what you think of can affect how your body reacts and moves. The first thing every student learns is how to relax. Every new student, especially those who have learned Tai Chi before, thinks they know how to relax. But after trying Intention Exercise 1 they found that their conception of what relaxing really is about is flawed. To relax on an external level is not difficult but to relax internally, to the level that is useful for the practice and application of our Tai Chi is much more challenging. 1. Stand upright with both feet together. Try to relax as much as possible in your own way before beginning. I want you to do this as I want you to be able to tell how much you can relax using your own method versus using the method presented here. 3. Imagine that each Zone represents an area of tension. Close your eyes and take a moment to feel each Zone in turn. Done? OK, now we begin the exploration of the principle of Intention Comes First (Yi Zai Xian) which is the first important principle of the Tai Chi method transmitted by Grandmaster Wei Shuren. 1. Imagine a torchlight positioned horizontally in front of you at Zone 1. 2. Now mentally switch the torchlight on. 3. As the torchlight is switched on the beam of light will move through space and shine on your face, momentarily blinding you. If you want the imaginary feeling to be more vivid try closing your eyes when you visualize the light hitting your face. 4. Let’s begin with Zone 1. Imagine that each Zone is a block of butter. The relaxed parts as well as the tensed parts of your body in Zone 1 are mixed together as one. 5. Mentally switch on the torchlight. 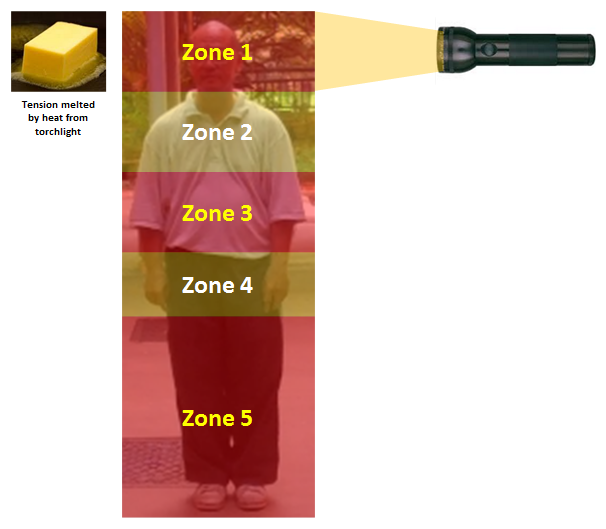 The light starts to suffuse you and its heat begins to melt Zone 1 which as mentioned in (4) is a block of butter. As the butter melts your tension too melts away. Any other parts of the body in Zone 1 that have been relaxed prior to beginning the exercise should now achieve a higher, more refined level of relaxation. 6. Take your time and let the tension melt away thoroughly from Zone 1. Once this is done you can repeat the process for the remaining 4 Zones. Unless your body is filled with excessive tension you should feel something interesting the moment your imagination brings the beam of light to shine on your Zone 1 and begins melting your tension away. Most students don’t pay enough attention to cultivating this step, thus even after years of practice they are unable to generate force that is intention-based. So again, if you wish to Master Tai Chi Today don’t neglect the fundamentals. Note – the exercise presented here is developed from the principles and methods transmitted by Grandmaster Wei Shuren to my teacher and to me. I have not tried to present Grandmaster Wei’s method as outlined in his books because they are difficult enough to learn as it is in person; much less by following a set of instructions over the internet. As such, I have developed simpler methods for teaching the same principles. As they say a rose by any other name ……..
Want to learn Tai Chi? At Singapore Yang Style Combat Tai Chi lessons covering forms, weaponry, push hands, fajing and applications are offered. Lessons are conducted in English. Send enquiry today at the link here. This entry was posted in Fajing, Intention, Learn Tai Chi, Learning, Practice, Structure and tagged learntaichi, taichi, taichichuan, taiji, taijiquan, weishuren, yang style by Mushin. Bookmark the permalink. Invest in weakness. The torch is a beatufiul analogy. Go weak, feel the light, feel your skin absorb it, if you do this long enough, and let your mind go slow enough, and make your body go weak, weak until it starts to drop, you must make your body weak until your posture starts to fall, then gently release to go back up then weaken again in different ways, finally weaken and relax completely to let your body be controlled only by torch-light and weakness. Weakening is important. Weaken until the posture drops. Feel the waves of relaxation from the torch. Warm yellow/orange torchlight from the front is earth energy, white torchlight from above is heaven energy. By as empty / blank as you can outside, but not to the point of forcing, when you close your eyes and notice an infinite grey fuzz, make that oustide everything that isn’t what you’re thinking about, that concetrates and intensifies the experience. Get body so weak it start to collapse – I cant explain how key this is, and doing what you say, and the weakening, keep them in your mind and imagine your hand being pulled to a location 30cm above, or somewhere else, keeping in mind *only* the thought of your hand being pulled (not of actually moving it yourself) do the torch-light and the weakness and watch what happenes when you hit it right – when you get it and it starts moving by itself, the light will start to power it and you’ll feel it start to flow through your body. You’ll start to feel that fuzz you feel from the trouch passing through your body, the longer you do it, the more pathways will open up and the stronger the feeling will be, but it is constantt learning. Torch-light is developing internal energy but not intention and not using that qi-flow (unless you aveh other steps youre not includiung). eventually trust your body to just do what it wants, let it move however it wants, and only hook onto the torch-light. It will choose to move you ways it feels like. You’ll feel at first liek it is something outside of you, but then you’ll realise it’s part of you that you’re not used to, having control, it also has inifinite wisdom, which is kind of cool. keep your mind *spotlessly clean* – on positive loving healthy clean things, i.e. avoid any pain/anger – which really damage your body in this state. need to be loving in this state in the simple sense of the word. Keep slowing the mind in throw out any thoughts any thought-avenues that aren;’t just doing this and get slower and slower in your mind while staying with the feeling, at a weak engouh – slow enough place the body will start to flash, stick with it and you’ll enter into chi moving directly through you and you’ll be able to move purely through chi, if you do this long enough a good feeling will start to generate and you’ll move into jhana – actually this is one method of enlightenment, but rests on being able to go into flashing-trance state, which happens when your thoughts are on the isolated sensation so long and throwing out other stuff that your brain starts to go the sensation automatically and forms a feedback loop.